This Oct. 26, 2017 photo shows prototypes of border walls in San Diego. A federal judge in San Diego who was taunted by Donald Trump during the presidential campaign has sided with the president on a challenge to building a border wall with Mexico. U.S. District Judge Gonzalo Curiel on Tuesday, Feb. 27, 2018 rejected arguments by the state of California and advocacy groups that the administration overreached by waiving laws requiring environmental and other reviews before construction could begin. A recently completed report by the U.S. Government Accountability Office found that U.S. Customs and Border Protection failed to include analysis of costs associated with building walls in different geographical locations, potentially squandering billions of dollars, according to the report. 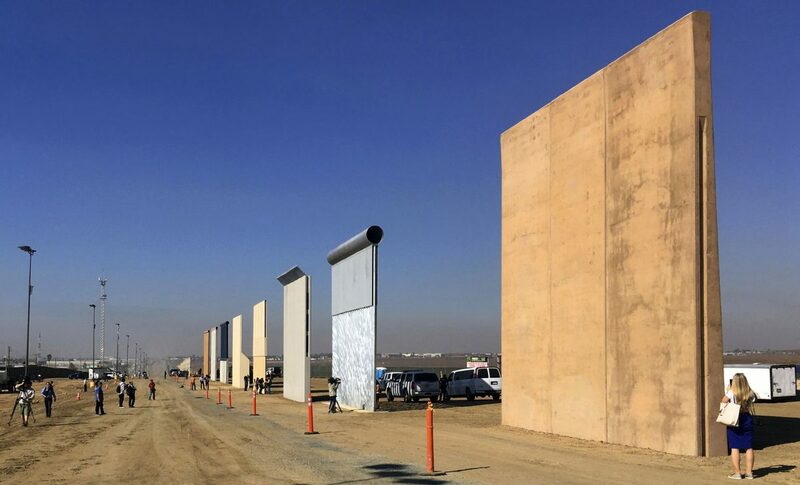 U.S. Rep. Filemon Vela, D-Brownsville, who sits on the U.S. Department Homeland Security’s Border and Maritime Security subcommittee, said the report only confirmed his and many border wall opponents’ concerns before the administration hastily began making plans for the construction. The GAO audited the U.S. Department of Homeland Security’s plan to implement a border wall along the U.S.-Mexico border beginning in October 2017 through June 2018, the report states. “CBP and U.S. Border Patrol developed a methodology for prioritizing future barrier deployments along the entire southwest border, which included input from (U.S.) Border Patrol officials, data on illegal entry traffic, and analysis of operational and engineering feasibility for each potential location,” the document states. But the audit states CBP failed to account for how construction at each different location would vary, and for the costs of dealing with private land. “…The strategy did not include analysis of the costs associated with deploying barriers in each location or segment, which can vary depending on topography, land ownership and other factors,” the report states. The areas of border wall construction include South Texas, New Mexico, Arizona and California. The GAO found CBP’s methodology was not the most cost-efficient. “Without assessing costs, consistent with leading practices for capital decision making, CBP does not have complete information for prioritizing locations to use its resources in the most cost-effective manner,” the report shows. Moving forward, the GAO recommended, and Homeland Security agreed, that the DHS should “analyze the costs associated with future barrier segments and include that analysis in future planning, and document plans for the planned secondary barrier replacement in the San Diego sector,” GAO officials state in the re-port. Plans for border wall construction in the Rio Grande Valley began in earnest last summer when CBP and U.S. Army Corps of Engineers began pre-construction work on several sites in Hidalgo County. CBP officials have since met with local stakeholders about tentative plans and locations for the already funded 33 miles of projects slated for Hidalgo and Starr Counties, 25 miles in Hidalgo and 8 miles in Starr. Opponents of the wall successfully lobbied against construction that would destroy natural resources and destinations such as the Santa Ana National Wildlife Refuge, where plans to build levee and bollard walls led to protests, and was subsequently left off the list of locations for border construction. Environmentalists around the world consider the refuge the “crown jewel of the national wildlife system,” where more than 165,000 people visit annually, according to a near decade-old study conducted by research-ers with the Texas A&M University. The study also estimated that more than $460 million pours into the Valley from ecotourism, the majority of which comes from birders who travel to the world-renowned refuge. But now, Bentsen State Park faces the same danger as CBP officials have plans that would place a levee wall right through the park. Vela has been a fervent opponent of border wall construction anywhere on the U.S.-Mexico border and specifically in the Rio Grande Valley’s environmentally sensitive areas.